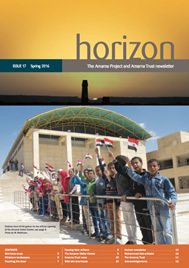 Horizon is the newsletter of the Amarna Project and Amarna Trust and is published twice a year. You can download the magazine in PDF below. It is free of charge, but a donation – no matter how small – would be appreciated. Donations can be made on the Supporting Amarna page on the Amarna Trust website.